Who needs manna from heaven when there are caffeinated brownies?! A Snack in the Face bakery has solved the age-old problem of how to get even more caffeine into my daily diet. As someone who tries to eat his weight in chocolate on a weekly basis and who uses caffeine (a PERFECTLY LEGAL DRUG) to mediate his experience of this thing you all call "reality," I find the idea of a caffeinated brownie to be sheer genius. Now the real question is: Should I move to Iowa in order to have on-demand access to these confections? Ames, IA is essentially Caffeine Mecca right now. 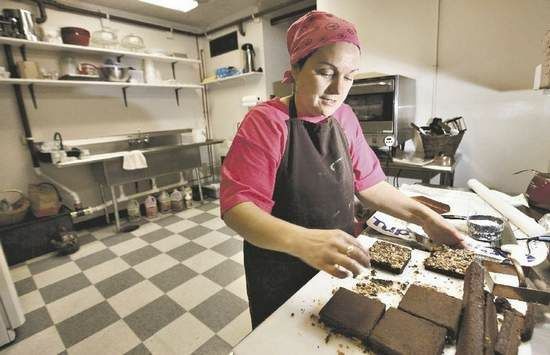 In a 400-square-foot storefront across the street from Iowa State University, a peppy woman cooks up a batch of Iowa's newest alternative energy. Allison Nelson pulls a sheet of brownies from the oven, lets it cool, then slices the sheet into 4-inch-long treats. Baked inside each is the magic ingredient of Nelson's business, a fledgling bakery called A Snack in the Face: 200 milligrams of pharmaceutical-grade caffeine. "Iowa's the capital of alternative energies: wind, ethanol, biodiesel," Nelson said. And now this - the tastiest alternative energy yet, and another step in the modern world becoming the most caffeinated society known to man. The nation's first caffeine bakery, now a year old, plans to expand to a larger manufacturing facility and supply convenience stores in Iowa and nationwide. The tiny Lincoln Way shop garners surprised looks from many who walk past. Some seem scared. But for most who pop in, it's like a revelation. 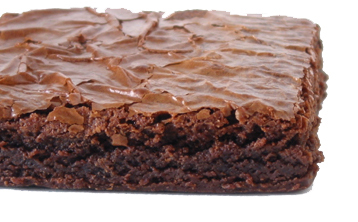 Their faces light up at a delectable brownie with an energy burst. Dear Baker Lady, please make me brownies. NOW!!!!!!! !